Can’t afford a Custom Shop creation that’s been fettled for the stage? Fear not, there’s plenty you can do to prepare a workaday electric to rock harder at your next gig. We join a bevy of seasoned techs to hear their advice on prepping guitars for peak performance. Roger Mayer, the audio electronics wizard who was Jimi Hendrix’s tone tech, offers this surprisingly simple piece of plec- related advice for taking to the stage with confidence. Roger Mayer is no stranger to fettling Strats and also suggests that close scrutiny of the output jack can yield tone benefits on stage. “One of the most important and overlooked things on a guitar is the output jack. The original output jack on a Stratocaster was a Switchcraft one that had a very strong grip to it. In fact, it was quite hard to pull the guitar lead out! “Keeping your sockets and the ends of your leads clean is very important,” says Roger Mayer, once again emphasising the importance of keeping connections optimal throughout the signal chain. “If you’re on the road, you’ll often need to clean them every time you play a gig. I used to do this for Jimi when I was out on tour with him. I mean, how long does it take to wipe the guitar leads down? I use several cleaning solutions. One of them is almost the same as lighter fluid - like Ronson fluid. It’s actually a very good substitute. James Sharpe, tech to top acts such as Opeth and Gary Numan, has this advice to offer on getting top performance from your guitar night after night on stage. “One thing that I always feel is overlooked from a performance point of view is the importance of stretching in strings properly when you change them. A well strung-up guitar with a nice fresh set of strings on is good only once the strings are stretched in properly. “Not stretching-in the strings can have an impact on all manner of aspects: the most obvious being how well the guitar will stay in tune. It also affects the pressure on the truss rod, therefore having an impact on the string action height. If your guitar has a trem system, then, again, having unstretched strings can end up giving you a nasty surprise. Ryan Taylor of Deadmill Guitars, who also techs for top bands such as Foals, gives this advice for making sure your Strat vibrato doesn’t throw your tuning out when performing live. 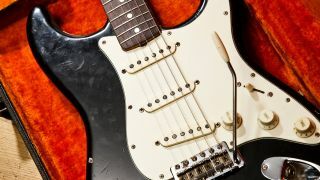 Simon Law, who techs for guitar luminaries such as Robben Ford, recommends considering a hardware upgrade for your off-the-shelf Fender if you want incremental improvements in tone and functionality next time you hit the stage. “Most ‘off-the-shelf’ guitars are fitted with fairly low budget hardware; even the most expensive custom shop guitars can be improved in this department. Fender-type guitars are usually fitted with bridges that are made from all sorts of alloys and metals. These can always be upgraded to far superior items made by such people as Callaham. “All electric guitars are fitted with various pots - short for potentiometers - switches and sockets,” continues Simon Law. “Some of these can be okay, but many affordable electrics are fitted with relatively modest-quality volume pots, sockets and switches. A better-quality pot can give a better ‘sweep’ from one end of its range to the other and a better tone. “Most single-coil pickups guitars are fitted with 250k pots; this value is chosen for its tonal response to the pickups themselves. If these measure less than 250k, then the guitar can become dark and dull sounding. If they measure more, then they can be bright and shrill. So ideally their actual value needs to be as close to the 250k as possible. “The same goes for the 500k pots fitted to humbucker-equipped guitars. Makers like CTS, Alpha and Emerson make some amazing replacements for not a huge amount of money, and they really are worth every penny.